Continuity mistake: Throughout the episode, Number 6's lapels switch from having solid to broken white piping and back again. Continuity mistake: Number 6 chooses a rather thin tree to cut down and fashion into his canoe. Somehow, when he's finished hewing out the wood to form the boat, it's considerably wider than the tree he started with. Continuity mistake: The Villager Rover attacks changes outfits several times between shots. He's wearing a striped sweater that turns into a pink jacket that turns back into the sweater, etc. Trivia: This episode was not shown in the initial U.S. airing of "The Prisoner" on CBS. There was speculation that its pacifist, anti-violence moral might have been construed as a Vietnam War protest, but the network's reason for censoring the episode has never been disclosed. Trivia: The bizarrely existential ending of the series, which answered none of the questions posed by earlier episodes (but rather seemed to say, "The answer is there is no answer!") 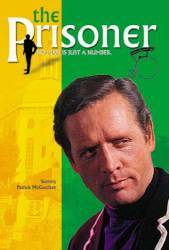 upset viewers so much that Patrick McGoohan says he was forced to go into hiding. His phone had been ringing constantly and people who'd found his address were banging on his door to complain. Trivia: This episode's writing credit reads "Paddy Fitz." This was one of many pseudonyms Patrick McGoohan used in writing, directing and producing most of the series himself. "Fitz" was borrowed from his mother's maiden name, Fitzpatrick. Number Two: I'm the boss. Number 6: No. One is the boss. Number 6: Unlike me, many of you have accepted the situation of your imprisonment, and will die here like rotten cabbages. Number 6: Everybody votes for a dictator. Question: Just who was Number 1? Chosen answer: We were never told. In the series finale [Spoiler alert] Number 6 demands an answer to that question, only to be shown his own reflection. Question: Five questions: 1) WHO kidnapped Number Six? 2) WHY was Number Six kidnapped and placed in The Village? 3) What was Number Sixs' name? 4) Where was The Village located? 5) Who was in charge of The Village? Chosen answer: 1) It's never made entirely clear, but it seems that the government, Six's employers, are involved. 2) Because they wanted to know why he resigned. 3) It's never revealed, although many fans assume that Six is really John Drake, McGoohan's character from the prior show Danger Man. McGoohan has, however, denied that this was the intent and there are some notable differences between the characters. 4) It's never revealed, although, as, in the final episode, Six and his companions are able to drive to London, it must logically be located within the British Isles. 5) No details are ever given as to who has ultimate authority over the Village. Question: What exactly was Rover? Was it some sort of automated robot? Chosen answer: We're led to believe Rover is some kind of robot in the series. According to books on the show, Patrick McGoohan was looking for an unusual guardian for the Village, looked up at the sky, and saw a weather balloon, which was what Rover was.